1. There have been no changes to your curbside garbage, recycling, or compost pickup. The guidelines for what can go into each cart remain the same. 2. Your curbside recyclables are being recycled. There has been some talk about the landfilling of recyclables. Republic Services, and the recycling facilities they partner with, have not used any DEQ concurrences to dispose of recyclables in landfills. 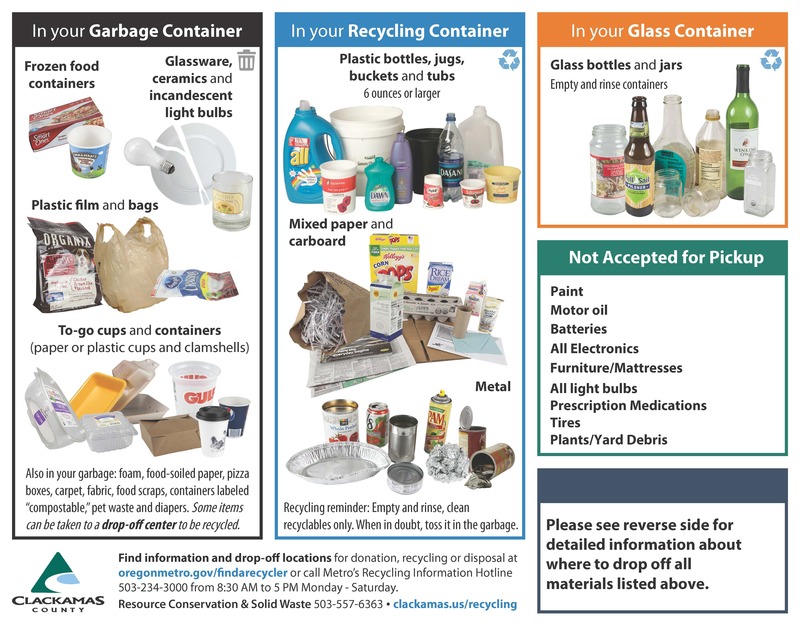 Items such as plastic clamshells, iced and hot coffee cups, lids, straws, plastic bags, etc have never been permitted in your curbside recycling bin. At this time, with the exception of plastic bags and film, there is no domestic recycling market for these plastics and they must go into the trash. . This is due to new standards in the Chinese recycling market that no longer make it cost effective to ship our plastics overseas (primarily due to high levels of contamination originating in the United States). Still Confused? We put together this presentation to help simplify it for you! When In Doubt, Throw It Out. What goes into my recycling cart? Plastic bottles, jugs, buckets and tubs larger than 6 ounces. Lids must be removed. Please avoid "wishful recycling", meaning that you put an item in your recycling cart because it feels like it should be recycled. This just leads to contamination, which leads to increased costs as recycling facilities need to hire more sorters and pay disposal fees for these items. This is a major issue, directly responsible for increasing recycling costs. When buying packaged foods, choose items that are packaged in recyclable materials. For example, bags of cookies instead of clamshells, pasta in cardboard boxes, and canned foods. If you notice packaging in your supermarket that seems excessive (ie, potatoes wrapped in plastic), utilize your power as a consumer to let the chain know you disapprove of this practice. Bring your own iced drink container when buying iced coffees and teas. Iced coffee cups are not recyclable. Unless you need them for accessibility reasons, decline straws at bars, cafes, and restaurants. Always bring reusable bags with you, but if you forget, choose a paper bag over a plastic one. #5 plastics can be recycled at the Tualatin Whole Foods in the "Gimme5" box. #6 plastics can be taken to Agilyx to be converted into a fuel alternative. Use Metro's Find a Recycler web site to find where to recycle items not accepted in the curbside recycling program and organizations that take materials for reuse. If you have a specific question about recycling, hazardous waste disposal or waste prevention you can use this link to email a Metro recycling expert or call Metro at 503-234-3000. Paint, motor oil, batteries, CFL or LED lightbulbs, prescription medications, needles, and many other products are considered to be household hazardous waste. These products must be taken to the Metro South Transfer Station at 2001 Washington Street, Oregon City. Paint can also be taken to the Miller Paint store at 544 N. State Street or Sherwin Williams at 15659 Boones Ferry Road.